The Gymax Cardio Folding Exercise Electric Motorized Treadmill Classic Model is basically a walking and jogging treadmill. In other words, it will be appreciated by users that wish to perform mostly walking or jogging exercises. It is on the same category as the Aceshin Electric Support Motorized Walking Treadmill except that the latter has Bluetooth connectivity, Hi-Fi stereo and support higher user weight capacity. 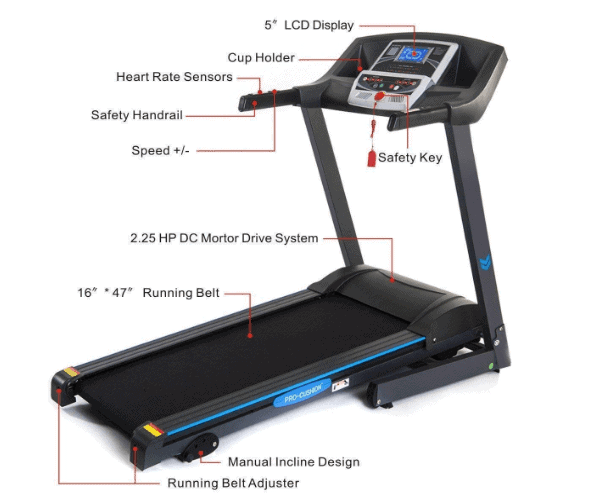 Nevertheless, Gymax Cardio Classic Treadmill new model has Bluetooth connectivity that allows you to connect the treadmill with a free G-Fit mobile app on your smartphone. This is Gymax Cardio Folding Exercise Electric Motorized Treadmill Classic Model in a nutshell. It is an entry-level treadmill designed to support 220 pounds/99.7 kg maximum user weight capacity. It has a 2.25 HP motor and a running surface that is sizable enough for walking and jogging activities. The motor provides 05-7.5 mph speed and requires a standard US power source (110V) in order to be functional. It doesn’t have Bluetooth connectivity but it does have 12 preset workout programs. 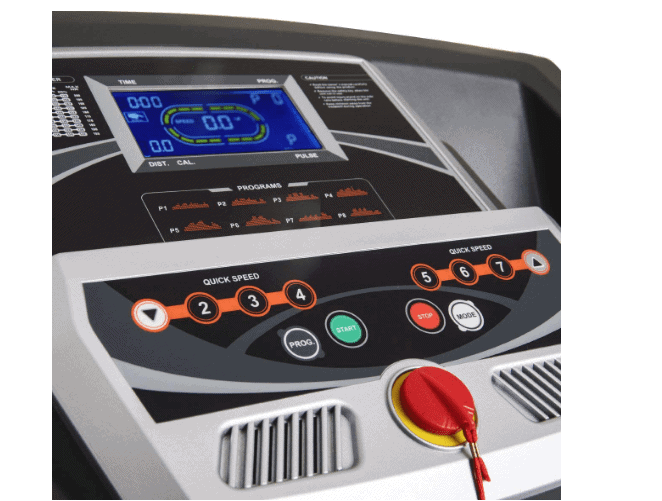 The console has several relevant buttons and also features a 5 inches blue backlit LCD monitor that displays workout data such as time, speed, distance, calories burned, pulse and modes. The treadmill is not very large and has a space-saving design that allows the user to fold up when it is no longer in user. It has a manual incline that could be adjusted into 3 levels and the treadmill is designed for home use. Click right here to have a peek at the discounted price of the Gymax Cardio Folding Exercise Electric Motorized Treadmill Classic Model on Amazon. As aforementioned, the Gymax Cardio Folding Exercise Electric Motorized Treadmill Classic Model is a walking and jogging treadmill even though ‘’running’’ is included in its name. The reason being, the motor is below the running treadmill capacity, the running surface size is not long and wide enough, and the speed it provides is just 7.5 mph. Therefore, this is a walking and a jogging treadmill at best and may support a light running possibility if the user is not tall in height. The treadmill’s frame is made of steel and coated with anti-corrosive paint that preserves it. It supports up to 220 pounds/99.7 kg maximum user weight capacity. Its overall assembled dimensions are 62 inches long by 26.5 inches wide by 49.5 inches tall. In other words, the workout area it will require would be 5’2’’ long by 2’2’’ wide and a ceiling height of at least 7’ high. The running surface dimensions are 47 inches long by 15.5 inches wide. This is just enough for walking and jogging workouts. The running surface is integrated with a Pro-Cushion system that reduces the stress that is usually felt in the knees and the ankles during and after a workout. There is a running belt adjuster on each side of the rear base designed to be used for the alignment of the tread belt. The folded dimensions of the treadmill are 32.5 inches long by 26.5 inches wide by 57 inches high. It has an easy folding mechanism and a soft drop system that allow the user to fold and unfold safety and conveniently. It has a steel stabilizer at the front base which also features the transport wheels for easy relocation process. The treadmill weighs about 96.5 pounds/43.7 kg, which is not very heavy but enough to boosts its overall stability. 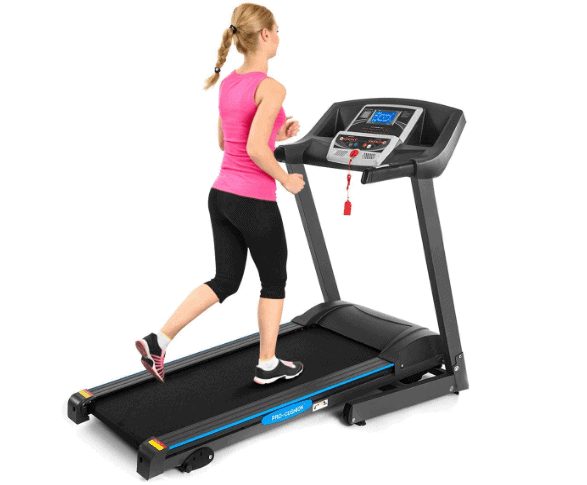 Speaking of stability, this treadmill is purchased together with a protective rubber mat that further ensures no wobbling movement is experienced during a workout. The motor is a key element in any treadmill because this determines the type of workout you can perform on a treadmill. It is the engine version of a treadmill. The Gymax Cardio Folding Exercise Electric Motorized Treadmill Classic Model is equipped with a 2.25 HP motor that supports walking, jogging and light running exercises. It is positioned at the front base of the treadmill and doesn’t vibrate or make loud noise during operation. This means a user should be able to work out without distraction and also be able to watch a favorite TV show/video on the smartphone or listen to good music. The family or the neighbor won’t be disturbed your workout activities either. The motor provides 05-7.5 mph speed which could be adjusted via the Quick buttons of 2, 3, 4, 5, 6, and 7 on the console and can also be gradually adjusted by an increment of 0.5 mph. The motor practically allows you to perform interval, speed or endurance training. The console on the Gymax Cardio Folding Exercise Electric Motorized Treadmill Classic Model has a lot of features such as the speed buttons, Quick speed buttons, the programs button, START/STOP buttons, the MODE button, the safety key, tablet holder, water bottle/item holders, and the 5 inches blue backlit LCD display. It also feature 12 programs that you could choose from in order to achieve weight loss, improve cardiovascular health, and overall physical fitness. These are easy to use programs that you can select and it will automatically assign the speed level that is appropriate for the program. The console also has extended handrails that feature HR sensors with speed +/- buttons that allow you to adjust the speed on the go while gripping the handrails. The HR sensors also transmit the heart rate data to the monitor when gripped during a workout. The monitor’s readability is highly good because of its blue backlit feature. It won’t be diminished even when viewed in a poorly-lit room. The monitor displays workout data that keep the user focused and motivated. It displays time, distance, speed, calories burned, pulse, and modes. The console and the motor require a 110v rated voltage power source in order to be functional. The Gymax Cardio Folding Exercise Electric Motorized Treadmill Classic Model has a manual incline that you can adjust to 3 levels manually. The manual incline design is designated at the right side of the rear base of the treadmill. The incline change allows you to engage in workouts that burn more calories, tone more muscles and build greater endurance. 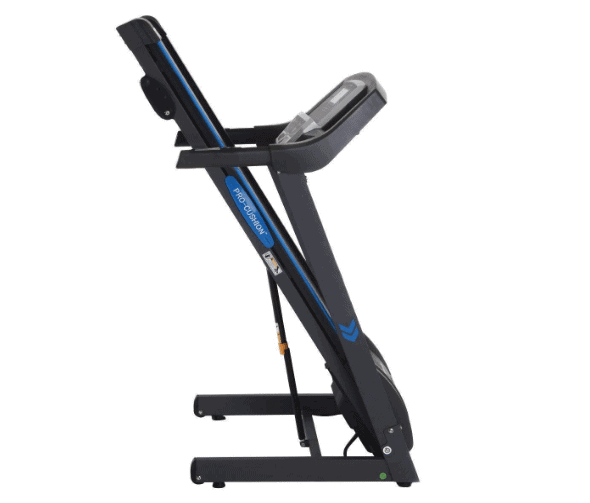 The Gymax Cardio Folding Exercise Electric Motorized Treadmill Classic Model has a space-spacing design that allows you to fold it up when it is not in use. This also makes storage very easy. It has a folding mechanism and soft drop system that make the folding and unfolding process very easy and convenient. It is portable with transport wheels for easy relocation. The folded dimensions are 32.5 inches long by 26.5 inches wide by 57 inches tall. Therefore, a storage space of 2’7’’ long by 2’2’’ wide will suffice. The treadmill comes with a built-in tablet holder and 2 water bottle holders that could also be used for keeping items such as keys, TV remote, etc. These accessories allow you to take calls, watch a movie, or listen to good music while working out on the treadmill. You will also be able to keep water within reach for hydration. The Gymax Cardio Folding Exercise Electric Motorized Treadmill Classic Model shipping cost depends on the vendor that is selling or you are purchasing from. However, Amazon provides free shipping and delivers within days from the day of order. The assembly of the treadmill is not difficult because it is delivered with the major components preassembled. That said, the console and its mast need to be attached to the core unit by you. An instruction manual and the tools required for the assembly are included in the package. The Gymax Cardio Folding Exercise Electric Motorized Treadmill Classic Model doesn’t require any major maintenance. You only need to keep it clean at all times. Further maintenance details are included in the owner’s manual. The Gymax Cardio Folding Exercise Electric Motorized Treadmill Classic Model is a solid treadmill for home use and users so far think it is everything as advertised.